Galvanizing has long been recognised as the most sustainable finishing process available to help the construction sector protect buildings against corrosion, with the recent emergence of a number of technological advances making the procedure even more environmentally friendly. The growing focus on environmental considerations in architecture, coupled with the continuing need to find cost-effective and ethically conscious building solutions, has put sustainability at the top of the agenda in the construction sector. 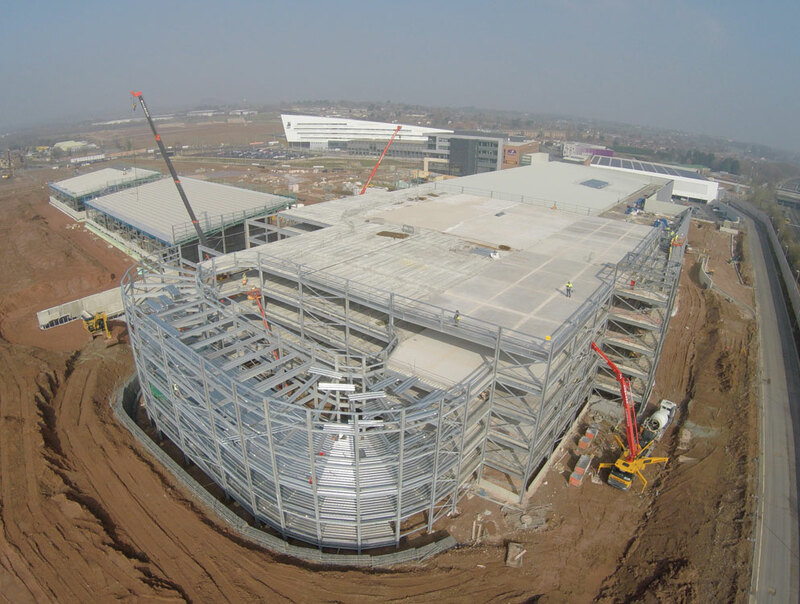 Hot dip galvanizing provides highly effective, durable and sustainable corrosion protection wherever steel is in use, from the structural steelwork used as the framework for major building projects, right through to final flourishes such as gates and railings. As steel is highly prone to rust – it’s estimated that worldwide, one tonne of steel turns to rust every 90 seconds – it is essential that the life of steel components is protected from corrosion for as long as possible. Hot dip galvanizing protects steel from rusting. Clean steel components are immersed in molten zinc at a temperature of around 450 degrees until the temperature of the work is the same as the zinc. During this process a series of alloy layers are formed by a metallurgical reaction. As work is removed from the zinc, the zinc on its surface will begin to solidify – as this happens excess zinc is removed to ensure a smooth finish. In contrast with other finishes or protective coatings, hot dip galvanizing results in minimal waste. Both the zinc ash produced from surface oxidation in the galvanizing bath and the ‘dross’ – a mixture of zinc and iron that accumulates at the bottom of the bath – are fully recovered and often used in the same galvanizing process or sold to make zinc dust and compounds for a variety of applications such as rubber additives, cosmetics and electronic components. 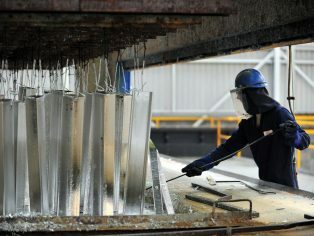 This means there’s no loss of materials that may occur during the spray application of other coating types and these processes – combined with the long life and recyclability of zinc-coated steel – make hot dip galvanizing a highly resource-efficient and sustainable process with minimal environmental impact. Because of the long life of hot dip galvanized steel products, scrap metal wastage is also reduced, while several studies have demonstrated the high economic and environmental costs associated with the repeated maintenance and painting of steel structures. Both of these burdens are greatly reduced through initial investment in long-term protection. The hot dip galvanizing process only needs to be carried out at the beginning of the construction project, but results in corrosion protection that can last up to 60 years depending on the environment it is used, without the need for any time or resource-intensive maintenance and replacement. As an industry, the hot dip galvanizing sector has also taken significant steps in recent years to reduce its overall environmental impact. A number of leading organisations are leading the way by introducing innovative concepts designed to reduce waste, promoting better use of resources and improving energy efficiency by reusing ‘waste’ heat created from furnaces used in the process. One of the most effective techniques is rainwater harvesting, which reduces the amount of mains water used in the pre-treatment lines. This multi-stage initial cleaning and rinsing process is integral to the operation as it removes all grease, scale, dirt and rust, utilising various diluted alkaline and acidic solutions. It ensures the steel is in an ideal condition to react with the molten zinc, where finally it is immersed in water to cool. To fulfil the cooling process while reducing demand on the mains water supply, rainwater that falls on to the roofs of plants is being accumulated and stored on-site via a series of gutters and tanks, and then recycled back into the galvanizing process. Debris is removed from the surface of the water, with the installation of a settlement tank allowing smaller particles to sink to the bottom, and clean water is then extracted from just below the surface where it’s then re-used. 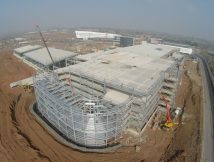 With its long lifespan, cost-efficient savings and significant ‘sustainable’ qualities, hot dip galvanizing is becoming widely known as the most environmentally friendly finish available to the construction industry.